Sneak Peek #2: "The Giving Tree" and "Nesting"
Just to give you a peek of two more images and show how else you can fill out the tree or add quick pops of color, I've added a little fur and feathers to the card, see, the little squirrel and bird are making friends! :) This is such a fun set! Next up we have "Nesting" from Asela Hopkins. 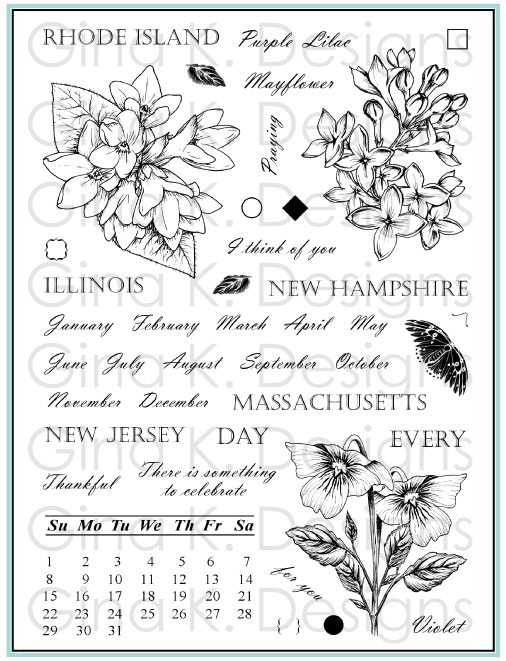 I love these realistic images and the script she used on the sentimental greetings, which would also be really nice titles for scrapbook pages. This little nest with three tiny eggs in it is my favorite, you just want to protect them by putting them in your pocket! I wanted that to be the focus on the card so I embossed a square frame around them with a Square Nestabilitie, (use the 2 B plates and rubber mat and shims with your A plate instead of the C plate so the die won't cut through) to frame the nest and stamped "Family" in Vivid Coffee Bean below. The eggs are colored with B00 and BG01. T he nest you don't have to color at all if you stamp it in brown! I love the simple elegance of this card, these colors and design just make me think of dainty little box from Tiffany's! We are giving away TWO of each of these sets being previewed tonight! Leave a comment on each of the participating designer's blogs and Gina will randomly choose FOUR winners from ALL of the comments! That means you have LOTS more chances to win free stamps! Gina will announce the winners tomorrow night, right here at the top of her preview entry just before preview day 3. (And you can leave a comment here too because all the comments will count. One comment per blog please.) Din't forget to see if you won from yesterday! Now check out more samples from the team and come back tomorrow for our final day of previews! See you tomorrow for our final day of previews, thank you for your comments! Sneak Peek #1: "Mugs and Kisses" and "Block Greetings"
Welcome to Day 1 of our previews! 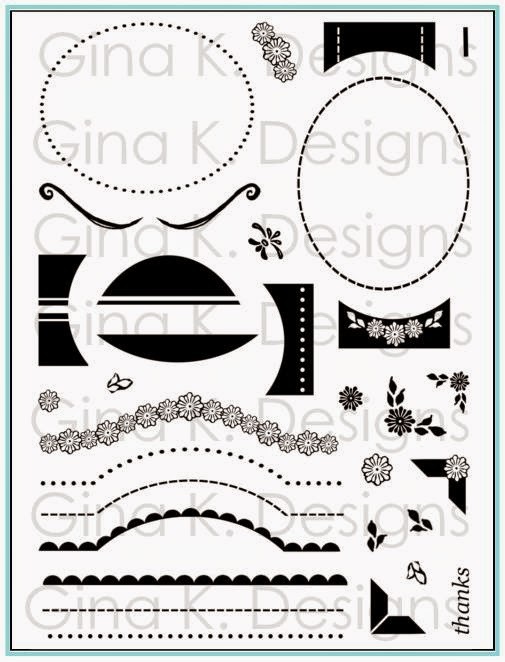 I am so excited to share my newest set from Gina K Designs: "Mugs and Kisses"! It's one of my favorite sets EVER! I have a collection of mugs which started when I was a kid and just love how much personality each one has, how sipping something hot and special out of a beautiful or funny mug can totally lift your mood! You will love having these large mugs to color or paper piece, as well as decorate with the images and greetings included or your other favorite stamps and images to really personalize them (like "Little Tees", but with cups!) And not just for coffee or tea, I've included words like cider, chai etc, which expand all the gift giving possibilities, all your beverage basics are covered here! Now stamp the mug again onto Basic Grey Jovial DP. I love two toned cup and saucer sets where you have a reveal of a different pattern or color in the inside, so I just trimmed out the cup around the handle, and the bottom of the dish. TIP: To cut out the space inside, don't worry about trying to poke through with your scissors, just make a small snip and cut out the oval, when you glue it down, you won't see that cut, I've left it slightly open here so you can see before adhering it. 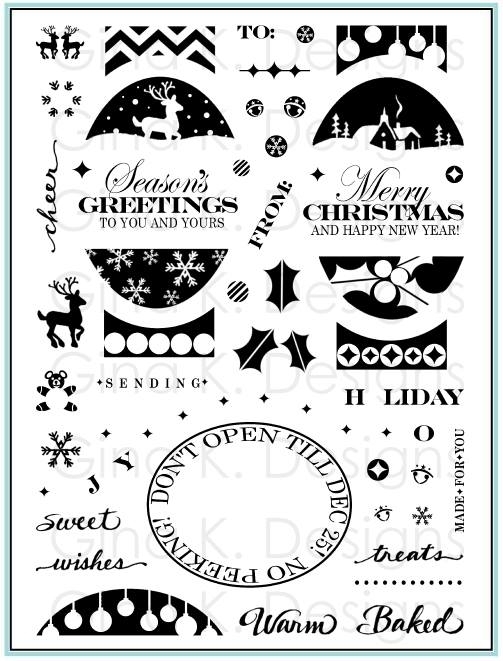 Now you can stick the little candy cane (stamped in cranberry on glossy CS) or spoon image down into this slot! And here is a peek using the more "masculine" mug. This is great for funny images and greetings! Here I just used the catch all "caffeine" option to the "Happiness is..." greeting and "Care to join me?" on the tag. I stamped the little beans to make my background on Kraft CS (sponged and a little colored and popped up pile for an embellishment. Here I shaded the left and undersides of the mug and handle with W-1. To cut out the portion inside the handle, just cut around the bottom of the handle onto the side, again this fits right back together when you adhere, I ran the 5/8" gingham through it and added some jute and a button. Mat is Black Onyx and card base is Chocolate Brown. and then stamped "Chocolate" below in this fancy little oval image. This oval fits into the Fancy Tag dies, the Petite Classic and Scalloped Ovals, as well as your other oval punches. 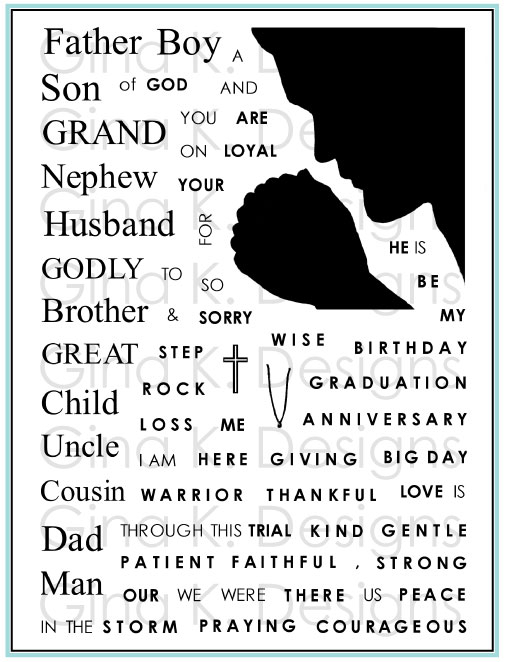 It is a really versatile stamp and frames all the single words and small greetings in the set, I love that! 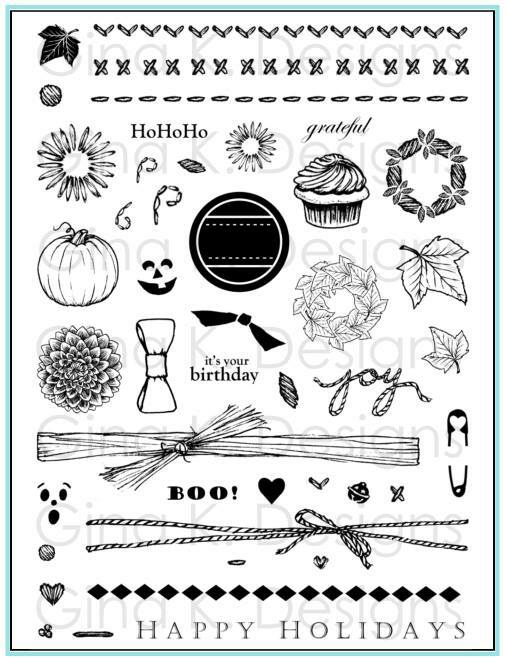 DP is Basic Grey Nook and Pantry, these are so many great prints in this paper pack, perfect for pairing with or piecing these drinks and treats! 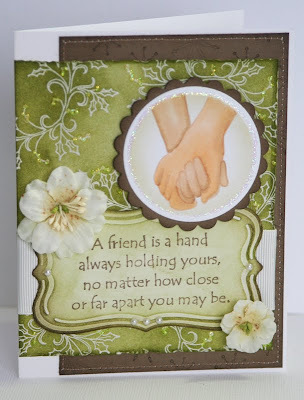 Our next peek is from Tami Mayberry, a set called "Block Greetings" designed to fit your Square Nestabilities. Today I used the Labels 15 die, since it's not just for classic or scalloped squares, any 4 sided Nestie die will do, so this is a fun way to make it even more fancy! I stamped the block in cranberry ink on Ivory Pure Luxury and embossed a greeting in the center with gold embossing powder. The larger Labels 15 die cut mat is Basic Grey Jovial DP. I layered these over some gold lined organdy ivory ribbon and the Ivory card base is embossed with a Cuttlebug folder. I added a strip of 3 mm pearls below it and used the Bow Easy to create the double bow. This card looks so detailed but really assembled pretty quickly, I really like this design for Christmas cards! Check out more samples of "Mugs and Kisses" and "Block Greetings" from the rest of our talented (and newly improved and expanded!) 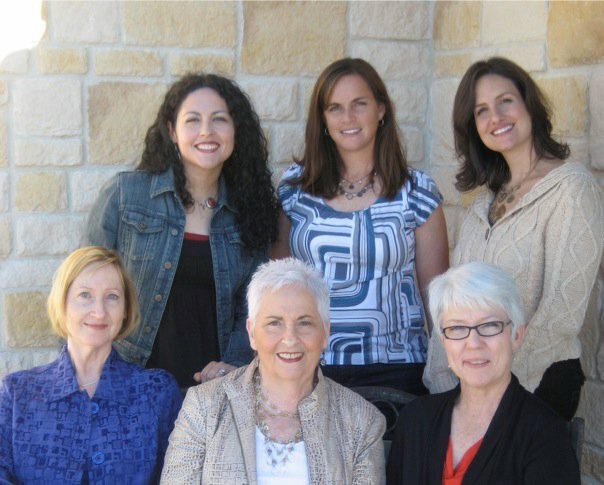 design team! And, this month, we are giving away more prizes than usual too! We are giving away two of each of these sets being previewed tonight. Hope you all had a fabulous Thanksgiving! More about the holidays later, got another guest spot with Kary and then we start our new release sneak peeks! I have only "played" with the new border from "A Year of Borders" that matches "Wild at Heart" once so far, so when I opened Kary's latest creation I squealed with delight to see how gorgeous the tiny border flowers snipped apart look popped up over the larger "Wild at Heart" frame, I love the mix of sizes together! Don't these little blossoms creeping out of the corner just make it come to life? And the tiny pearl in the center of each is such a sweet touch! I stamped Wild At Heart frame stamp onto white cardstock with pink ink (Versamagic Pixie Dust) then embossed with clear embossing powder. 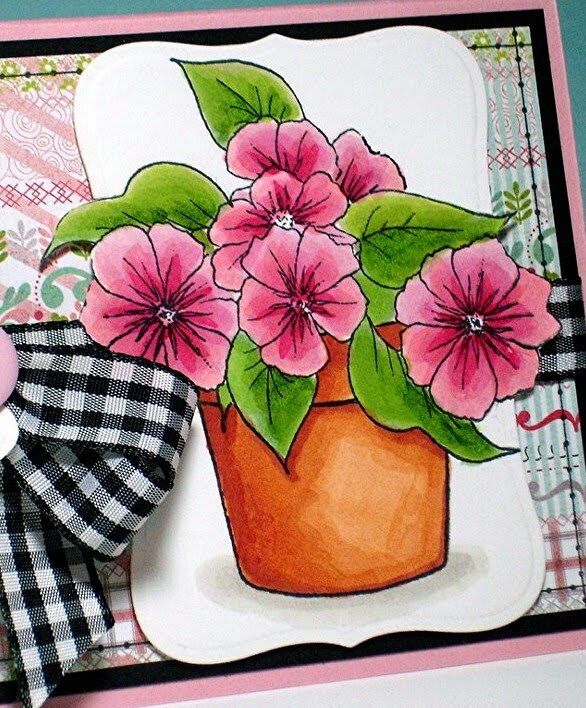 Then stamped the flower border using a darker pink (Versamagic Pink Petunia) and clear emboss it. Cut out the flowers, and added pearls on the centres. The large flower piece was added onto card base with foam squares. Then I used a metallic silver pen and drew a frame on the card base. Then adhered the cut-out flowers onto the card w foam adhesive as well as the sentiment. I sponged the sentiment with the pink ink and added some pink faux stitches around it (using Memento Angel Pink). Let's go see another beautiful "A Year of Borders" creation from Kary! STV Color Spotlight #3 AND Shopping special! Hello! Hope you all had a fantastic Thanksgiving! Today, not only do we have a color spotlight challenge, but Gina has also issued a Black Friday Coupon, good through Sunday, I know you'll want to take advantage of it!! Spend $35 and get any one of these 6 Gina K sets below (some of my favorite and most often used of hers!) FREE, your choice which one! 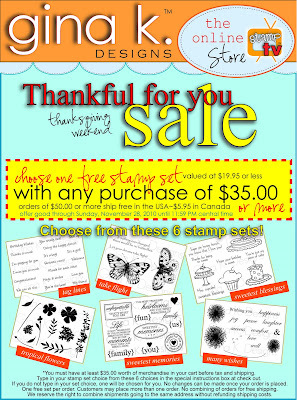 You can also place multiple orders of $36 or more to choose more sets! Yes, yes I used the butterflies AGAIN, but I HAD to when I saw the sets in the special, combining my "A Year of Borders" with "Take Flight" , one of my favorite butterfly sets ever! I love all the possibilities having the large butterfly adds to the butterfly border and vice versa! This week's color challenge is Ocean Mist, Green Apple and White, so I used these for my mats, and then stamped the border in aqua, inking up just one in black before stamping. I colored that one, then stamped the large butterfly in Memento Black colored with Copics B00, B02 and G99, and cut it out to pop up. Crystal Stickles (which is perfect for this color challenge, iridescent with blue green sparkles!) and a trial of adhesive bling add add shimmer to this card and wind around this beautiful sentiment from "Take Flight". As you can see, these sets are a match made in heaven, but with the special on top of that you really can't miss! Just for example, buy "A Year of Borders" and a pack of each of these two colored cardstocks in the challenge (or anything for an additional 11.05) and you'd be getting this perfectly coordinating "Take Flight" set for FREE! :) What a deal! So have fun shopping! 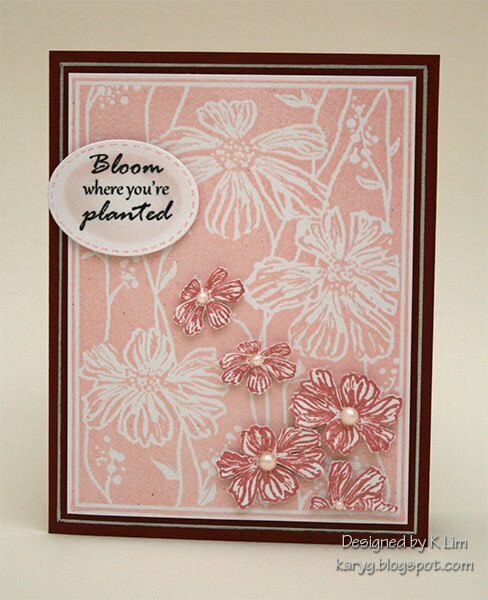 And we hope you find time to play the color spotlight challenge this week, you could win free stamps! Be sure to use the tag STVCSP3 when you upload your card to STV using these colors to the gallery for a chance to win! Gotta run, SO much stamping to do for our release next week, can't wait to share the snippets and sneak peeks! I recently reached out to my past guest designers to let them know I would love to feature them again on my blog, revisiting the set they designed with. The first person to reach back was Allison Cope, with this beautiful "Hand in Hand" sample, how precious (and appropriate!) is that? "A friend is a hand always holding yours, no matter how close or far apart you may be." This white, cocoa and olive combo is so pretty, and her coloring just keeps getting better and better! I love how she stamped this in a tan ink to make the outline more subtle, feel like I could reach out and grab hold of these hands! Instead of patterned paper, she created this beautiful embossed resist background with the holly vine from Theresa's "A Very Merry Christmas", and I love the sparkle she added around the round die cut, adds an extra bit of magic to the image! Pleas be sure to visit Ally's blog and see what she has been up to lately, her blog is always full of crafty inspiration! Thank you every much Allison for taking the time to make this beautiful work of heart! Have a wonderful Thanksgiving, be safe and count your blessings! And THEN made this gorgeous little sets of gift cards to go inside! 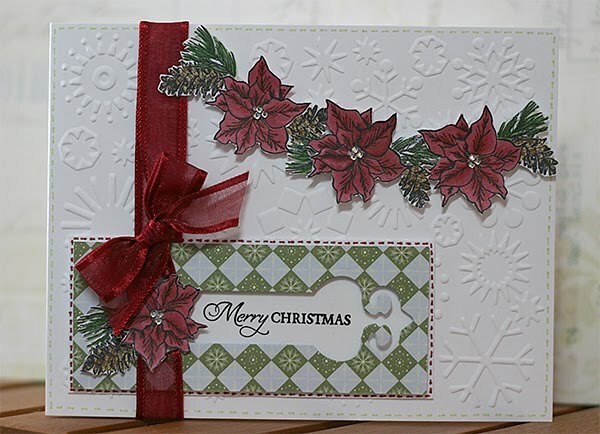 This CAS design with the hand drawn border around the outside and single poinsettia at the corner is so clean and fresh and easy to mass produce, and this scalloped card is like nothing I've ever seen! Isn't that sweet? The card is mostly white but that shaped border and faux stitching just gives it so much personality, I love it!! 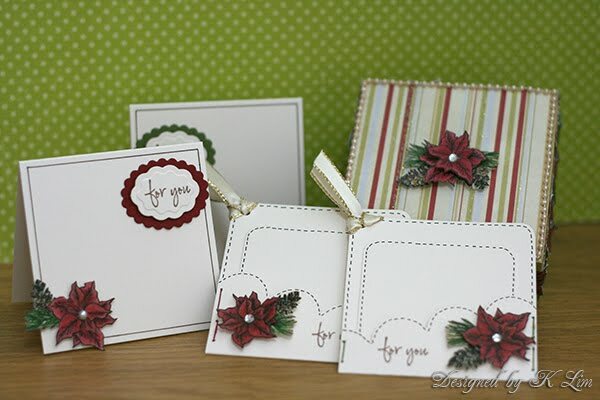 The different ways she used these flowers just shows how versatile this size poinsettia is for cards and altered projects. 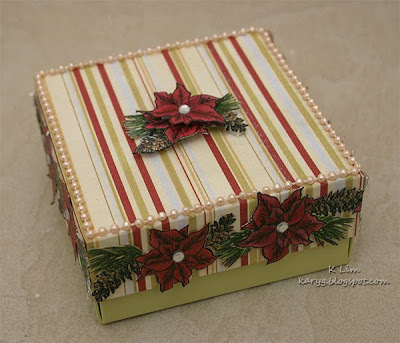 This little box could be repurposed year after year to decorate your space during the holidays. The addition of aqua to the traditional red and green gives it such a fresh feel and glitter on the striped DP is so festive! The string of adhesive pearls adds permanence to the paper box and easy elegance. I also have to point out how cute the little corner ribbon treatment is, and simple to do, just make a hold in the corner, slip a loop of ribbon through and then pull back through itself, thanks Kary for reminding me of this, like a cute tag AND card at the same time! Top cover 3 1/2"x 3 1/2" x 1" (for the height of the cover) and box bottom measures 3 3/8" x 3 3/8" x 1 1/2"(height of the box base. The note cards are 3" x 3". The tag card was cut 4 1/2" x 3" then folded at 3", cut at an angle (on the shorter folded flap) then using EK Success Double Embossed Dotted Lace punch to punch the scalloped shape. The tag measures 2 1/2" x 2 1/2". Kary will be providing more detailed instructions on her blog , so be sure to look for that! Let's go see another project on Kary's blog! She has been such an amazing inspiration to me with this set and I look forward to sharing more seasonal projects Kary creates with "A Year of Borders" in the months to come! Good morning! 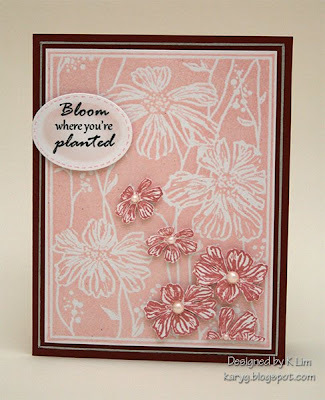 Happy Monday and welcome to another Sketch Spotlight challenge with StampTV, Gina K and the team! If you follow my blog or are familiar with my sets, you know I love puns! I'd been thinking about making a card like this for a couple weeks, after I was reminded by many of our GKD customers and fans during our peeks of holiday images that Christmas isn't associated with Wintery weather in their part of the world, but summer! o this holiday card is beach inspired, "Jingle Shells", get it? hee!! This sketch I thought was perfect for using the border from "A Year of Borders", large sand dollar from "Gifts from the Sea" as the focal point and some little bells as accents! I created a computer generated sentiment and printed it on white layering weight CS to go below the border. Images are embossed with Versamark and gold EP. Base and mats are Red Hot, ribbon is 5/8" stitched Pure Luxury. I pierced holes through the border layer and hung the bells from jump rings. After working on this, I have a couple more ideas I'm really excited about it for beachy Christmas cards I'm going to have to make with these sets will share soon, (a virtual high five from me if you beat me to it!) ;) I think our family members in Florida (where it WILL be winter but won't feel like it!) will really get a kick out of them!! Hope you'll pay along with our challenge! 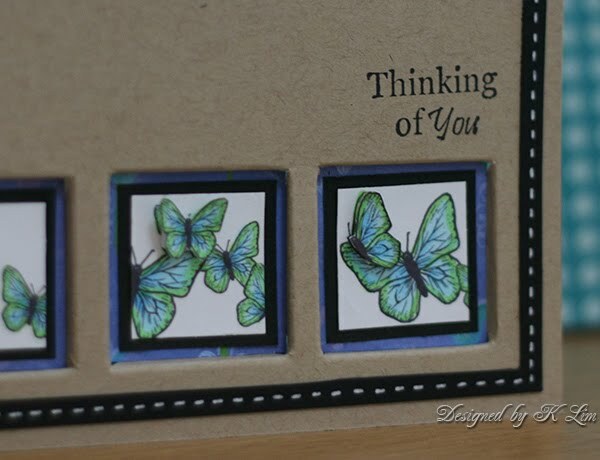 Be sure to upload your card with the keyword STVSKSP3 to the StampTV gallery, and be sure to check out Gina's newest video with this sketch and more samples from our team! It's the weekend, hurray! Time for another Color Spotlight Challenge with Gina K and the gang, here is this week's combo: Today I used my border from "A Year of Borders" that matches my "Wild at Heart" set. This was my first opportunity to play with this border and I am thrilled with how it turned out! Great to use when you need quick pops of color without coloring an image! :) These bold images are actually "negatives" of that negative frame image ("filled in") in actual and smaller sizes. I used markers to match the Lipstick Red and Green Apple mats to ink up the petals and centers, coloring the red parts quickly first with a brush tip, then the green and huffing on it before stamping, and then stamped them on two pieces of white cardstock. TIP: If you want a more blended or watercolored look on these, after stamping in color you can drag a wet brush over areas to let the color bleed a little like I did here in the centers. 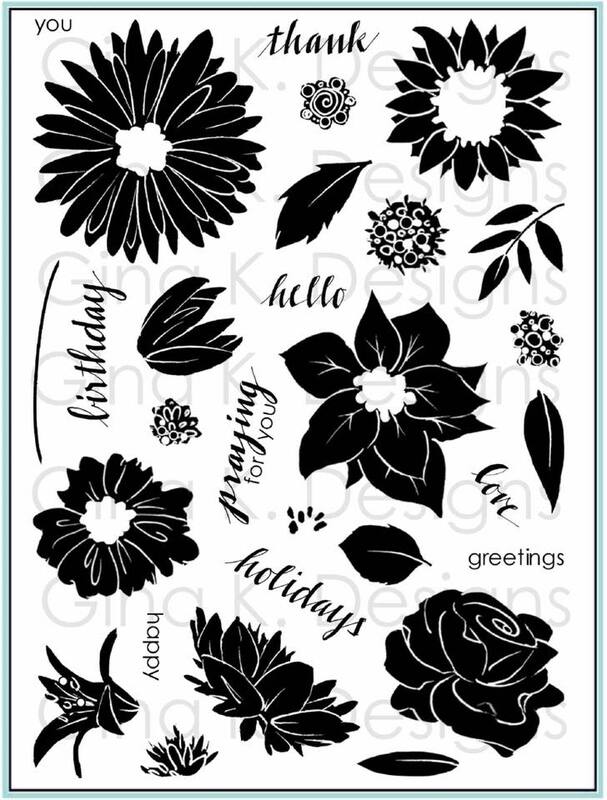 I did the same thing on the front side of my envelope and then on a scrap of white CS that I could cut out to pop up individual flowers around the die cut oval label and greeting from "Versatile Verses". I also used "In Stitches" around the edges, stitched ribbon tied near one flower like leaves and a stem, and embossed the green layer with the Fleur de Lis folder for some added texture, rubbed with green ink on the edges to make the embossing pop. Hope you'll find some time to play, just upload your creation using this color combo to the StampTV gallery with the tag STVCSP2, you might win some free stamps! Be sure to check out the Friday video and all the other samples from the team as well with these colors on STV. Still got a sick kiddo, so I haven't stamped in days! Praying for a better weekend, healthy for all and super productive, same goes for YOU! :) Thanks for visiting! 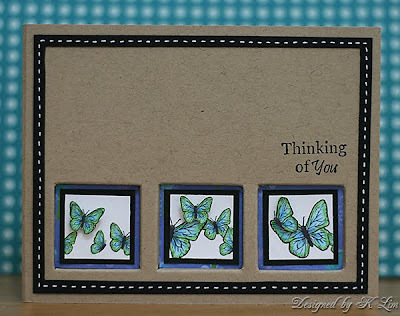 Back with another beautiful "A Year of Borders" creation from Kary! Today she did this clever "inchie" design, with the panels from the one butterfly border in these recessed windows, isn't that gorgeous? I love the way she colored them with the blue and green, looking almost iridescent and popped up a few, so much dimension! She kept them in the same order and configuration as the full border, an without any dry embossing, patterned paper or ribbon, the images really take center stage! I also really like that delicate blue and green print behind each frame, you can only see a sliver but it really looks fabulous with the butterflies coloring. The tiny faux stitched border she drew in white on black really pops off the Kraft. Sentiment is from "Buds and Vases". You can see how to make these recessed windows here, Kary pointed me to the tutorial, all you need is your little Scor-Buddy and a craft knife! (Obviously on a much smaller scale than Beate's sample!) But it really adds a lot of drama to the inset frames and is such a fun twist going down instead of popping up! You could also punch out square windows and place the panels inside your card for a similar look, which would be really fun too, but that type of card is harder to photograph! Now let's go see another project using this set on Kary's blog, thanks for visiting today! for all your well wishes and sweet words about William's card! It was so thoughtful that you all addressed your comments to him, he was so tickled as I read them all. Several comments made him laugh out loud and he was excited to hear they were coming from all around the world (and also proud I think that his card got more than most of mine do.) ;) His older brother explained to us William got more comments than I do because for him being only 5 everyone knows that his cards will be much better than mine when he's my age! He still has fever so he will be home again tomorrow too, but we had such a nice snuggly day of being in bed, reading books, taking a morning nap (both of us! heavenly!) playing board games. Honestly, if they aren't feeling miserable I enjoy a sick day here and there with each of my boys, it's such a peaceful time together without all the wiggling and energy to just be quiet and BE! Coming up, a guest spot with Kary!! William came home from school today running a fever, so I haven't finished my tip sheet yet (plus a super dee duper welcome post to our new rock star designers!!!) I'd already finished this post, so it seemed a good time to post, please pray he gets better, thank you, tomorrow looks like it will be a "snuggle day"! William's kindergarten teacher had a birthday this past week. He made her this card all by himself! (Well, besides me cutting the mat and helping to glue it down straight!) He had very specific ideas about what he wanted: stamps, "She'd like flowers ("Buds and Vases")...roses ("A Year of Flowers"), and a bee ("A Beautiful Life")..do you have a vine?" He drew his own vine and added the leaves, then colored the rest with my Copics. I told him usually it's best to choose his base color from one of the colors he used on his images, so he wanted Turquoise Sea. Finally he said "I want it to look like I sewed it", so we pulled out "In Stitches". He also went through my bling and said he'd like to make a little pearl trail behind the bee "like you do on your cards". There you have it, he even stamped the inside and signed his name (didn't get a pic) Come on teachers, you can tell me: isn't that the kind of thing you keep forever?? 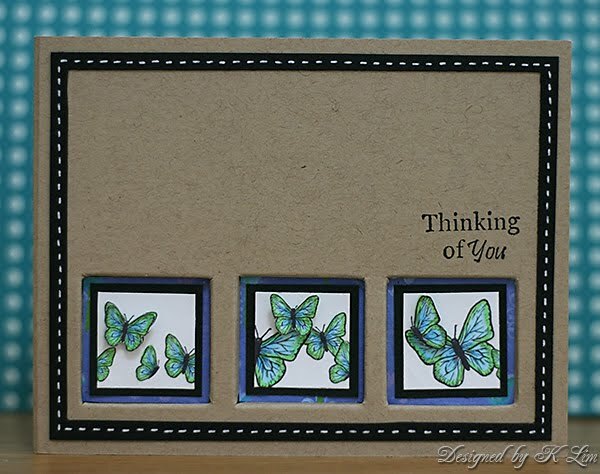 Not thinking about how you would have JUST seen my other card for the last challenge with the same butterflies, I have them on today's card, too LOL! Sorry about that, I love how it turned out, but if you are needing of change of pace, just squint and pretend I used leaves! 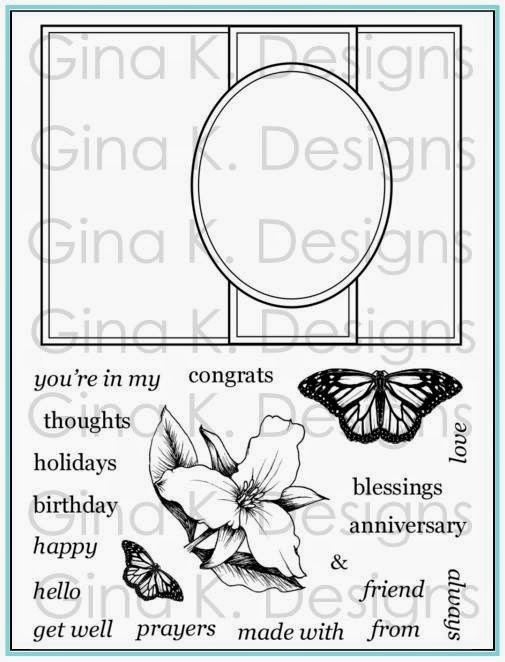 (The colors would be the same...) ;) Today I stamped the butterfly border in Wild Honey on the bias, stamping diagonally from corner to corner on the Ivory mat , leaving about a 1/4" between each row until the entire piece of cardstock was filled in. Then I sponged it with Wild Honey and Vintage Photo inks. Doesn't like that look like a printed piece of patterned paper? Angling the border gives the card a lot of energy and is a nice contrast to the horizontal, colored border. 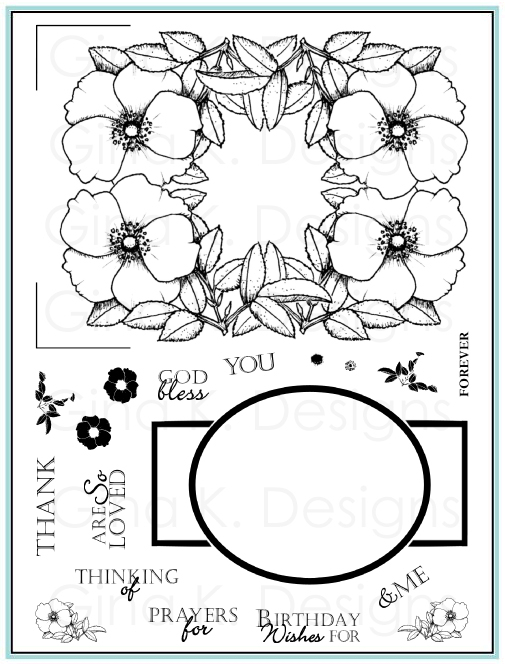 I already had this Circle Nestabiltie die cut (Fresh Asparagus) out on my desk so I swapped that for the rectangle and went ahead and let it peek over the top of the border, little changes like this are okay as long as you can still see the inspiration sketch in it! I used the "Labelled with Love" greetings again, they fit so perfectly in this small space, and cut out one butterfly to pop up next to it. I used a green pen to make the faux piercing around the circle and my Scor-Bug tool to do real piercing around the edge of the mat. Button is Pure Luxury and base is Chocolate Brown. Images are colored with Copics. Happy Monday, here's to a brand new week, make it a great one! Froday i'll be saring a sample using the bold flower border from this set that matches "Wild at Heart" for the Color Spotlight, can't wait! Please go check out Keri Lee Serieka's blog today for some beautiful "A Year of Borders" autumn fun! I am so sorry I haven't posted my border tip sheet yet, I just know I am forgetting some important tips and hate to post before I'm done! 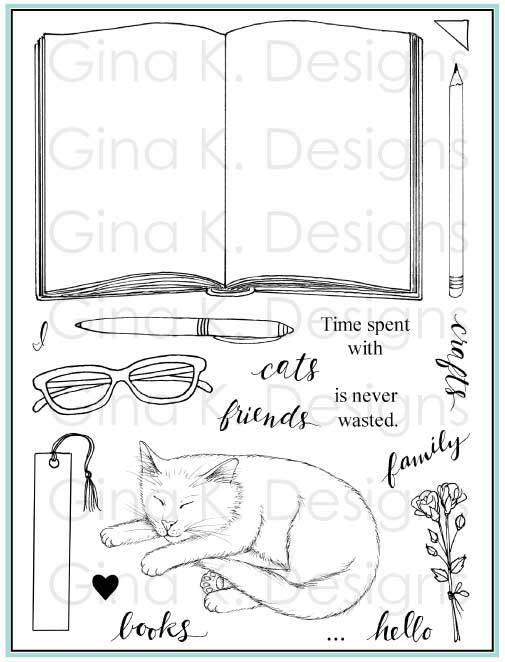 You'd think I would have been working on that a lot this week (but I got a little side tracked working on a new stamp set, shhhh!) :) Tips ARE coming, I promise! Hello! Here is a card I made for my mom's birthday with "Buds and Vases" . I used the Labels Eight Dies to frame up the flowers and pot and a smaller one for the tag. DP is Basic Grey Olivia, and cardstock is Pure Luxury White, Black, and Innocent Pink, button and 5/8" black gingham and Pure Luxury also. Use the Bow Easy for that beautiful double bow! 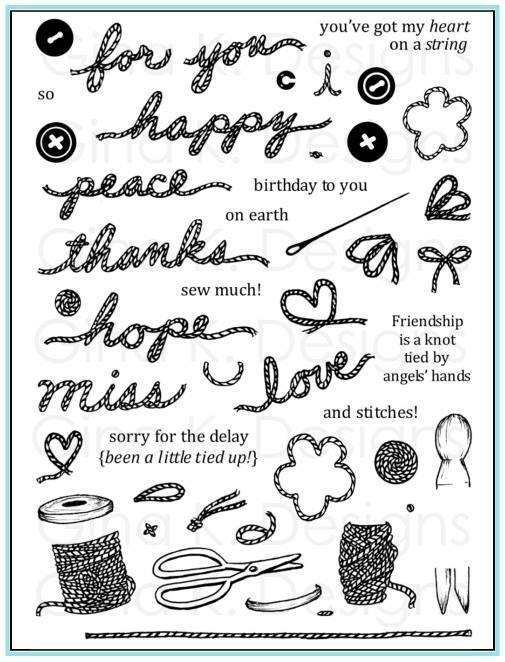 Used "Notes to Mom" for the greeting and "In Stitches" for the stitching. Here is a brief tutorial showing how I like to color my pot from "Buds and Vases". I will do some separate tutorials for how to color the flowers because there are so many different ways to color flowers, not just their colors, but the way some have petals that are darker on the outer edges than inside , and vice versa, some have stripes, etc. But the pot follows some basic rules! :) I almost always color my images with the light coming from the right, which is what I am doing here. I used only two colors for this pot, and NO blender. First I colored the entire pot with one coat of E97 Deep Orange (a nice peachy, pumpkin color), moving in circles. Then I go over the area on the left (away from the light) and under the leaves with a second coat. (I masked the cluster of leaves twice for this, so your leaves might overlap in slightly different places, but just trace under them.) I keep a large patch "open" on the center right. Now I take E07 Light Mahogany, a much deeper rust color, and go under the leaves left side about a quarter inch over. I trace a tiny sliver of the bottom of the pots curve and just a smidge on the right. This is going to really make your pot look rounded. You can even stop at this step if you want very dramatic shadows or go on to the next step for a more blended look. Now I am going to do some tip to tip coloring to make this third in between shade: touch your lighter marker to the dark marker to pick up some ink and color over the darkest areas and work outward toward your lightest. Isn't that in between color beautiful? Grab more ink from the tip of the darker marker as needed. If you find you've blended too much and really want that dark area to pop, go back up to the second step and retrace those same areas a second time with your dark marker. As you can see I didn't really worry about trying to get the color completely smooth, here it actually adds a bit of rusticity to the Terracotta. Here it is on the finished card, I added a shadow by making a little oval below the pot with W-33, and then W-1 on the outside of that to soften the edges and diffuse the shadow. I hope this is helpful to you! This is the simplest way I find to color with Copics, the fewest steps with the fewest markers, just thinking about objects you need to shade as dark, middle and light. I submitted this card for a call but it didn't get picked up. That's okay, it's for my Mom and I know she'll love it! Have a great weekend! How's this to brighten up your day?! Gina throws down a color combo on StampTV that's sizzling hot AND super cool! I used my new "A Year of Borders" set, the butterfly border being the best fit for today's combo. It's such a happy stamp! I did a spotlighting technique here with my circle punches, so get ready for a little mini tutorial! Stamp the border once on your mat. Now stamp it again on a separate piece of cardstock and punch out random areas with two different sized circle punches (3/4" and 1"). You will line these up over the first border like you do when paper piecing. I also punched out some slightly larger circles (1" and 1 1/4") in the Red Hot and Turquoise Sea to mat the stamped circles. The red string is embroidery floss. I left the back border uncolored and then colored in the punched images with the red and turquoise Copics. I staggered the color of the mats behind them and then colored them in with the opposite color, so one with a red mat had a turquoise butterfly and vice versa. Some have more than one image in them so I used both colors. Isn't that a fun look? The up and down placement of the circles gives the border and card a lot of movement. The tiny red butterflies that are popped up, I just inked up one little butterfly from the border and stamped it twice onto a little scrap of Red Hot cardstock, trimmed them out with my Cutterbee scissors bent the middle and attached them with pop dots. I love how tiny these are! :) I added a fine dotted trail behind each with a black pen. Greeting is from "Labelled with Love". 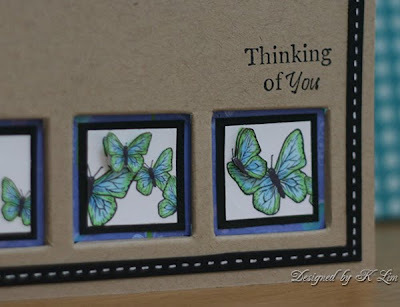 Please go check out Gina's video on StampTV where she creates a card from start to finish using this color spotlight and take her challenge, you could win some free stamps! It is my great pleasure to introduce my newest guest designer who will be working with "A Year of Borders" this month and beyond: Kary Lim! I first noticed Kary's artwork in our StampTV gallery, I loved the way she was interpreting my images and a card she made with "Gifts from the Sea" sold me that she was a perfect choice for my set this month! 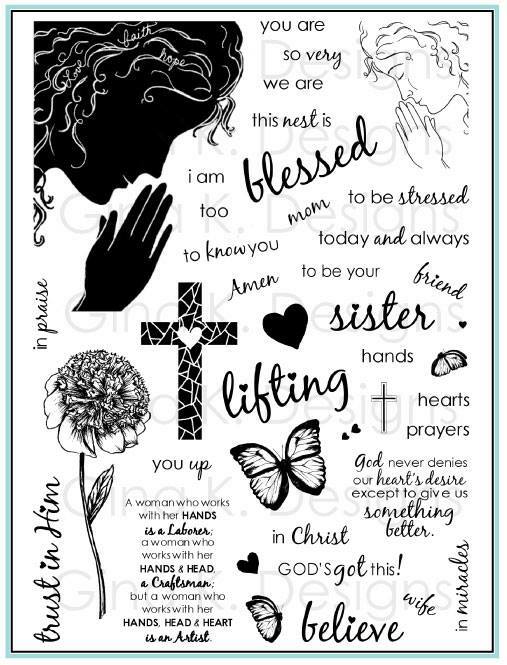 She is as talented as she is humble, each email I receive often opens with "pardon my coloring skills" but attached is a card that takes my breath away! Today I am sharing this gorgeous Christmas card she created, it has me taking lots of notes! My name is Kar-Yeng Lim, but I go by Kary because it’s easier for everyone to remember. 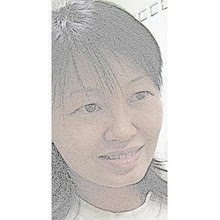 I am a Malaysian Chinese and I live (most part of the year) in Kuala Lumpur. I am an Accountant by training, but I worked in IT Projects later part of my career. However, now I’m more or less “retired”, and co-own a small business with my sister in New Zealand. I am the middle child in the family (you can image the headaches I gave my parents growing up) - I have an older sister who is also an Accountant and a younger brother who is a New Testament Lecturer in a local Bible Seminary. I also love to travel, and I’ve been very fortunate to have worked and lived in several different countries. I don’t know how to describe my style, I guess I like simplicity. I don’t put too many embellishments but I am attracted to colours a lot. I love patterned papers and colouring stamped images. So on most of my cards, you will see more than one colour and lots of colouring of the stamped images. My favourite technique would have to be colouring with markers and colour pencils. Recently, I attended a Copics class and started buying Copic markers, so I’m learning how to use them. Blue is my favourite colour, and I also love bright colours on my cards. But I’d have to say mostly blue/white combo is my favourite. Gifts by the Sea – I LOVE being by the sea, it evokes a sense of freedom and awe at the same time, of how beautiful everything is by the sea. Hmmm… this is hard, but I’d have to say Gifts by the Sea by Melanie, and also Vintage Borders by Nina Bracket. My Stamps, Cardstock and Patterned Papers, my colouring tools, Tonic trimmer & Scor-buddy. 11 years! I discovered stamping in Louisville, Kentucky when I was there for work. A Stampin’ Up lady showed me some stamps and gave me a catalogue. When I got home, I started stamping and haven’t stopped since. Everything around me. But most of all, I’d have to say the stamps inspire me. I’d look at a stamp and ideas would begin to form in my head on what to create, the design, colours, etc. I don’t use colour charts (believe it or not, I find it hard to work with) nor sketches (unless for challenges), most times I just grab whatever I have on hand and get going. 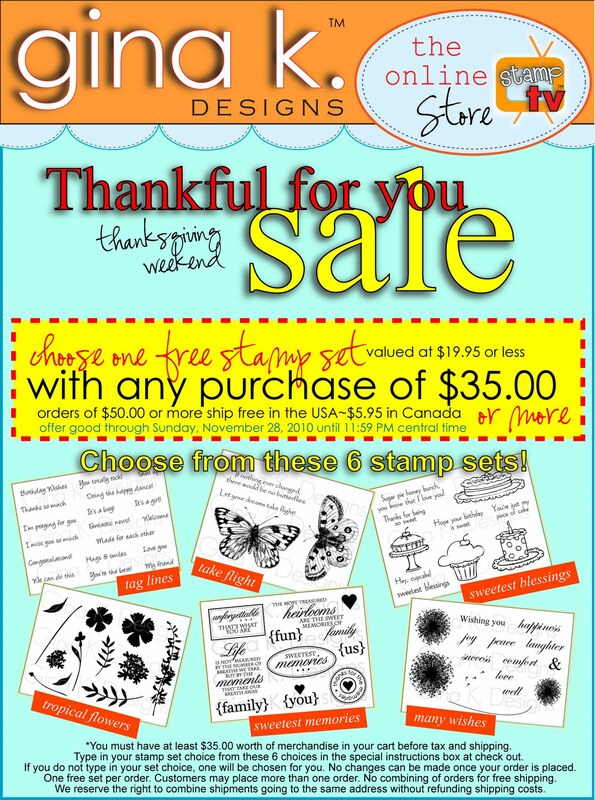 Well, I bought a set of corner stamps from the Stampin’ Up lady in Louisville (which I still have today). I can’t recall what I did exactly but definitely I made some cards. It was so fun that I contacted her again, and had my brother (who was studying in Boston then) to purchase more stamps for me and ship them back to Malaysia. I’d have to say making my friend’s wedding invitation some years ago. She lives in California, but somehow we managed to get everything organised via emails. I spent two weeks (at nights after work) to complete her wedding invitations. I couldn’t attend her wedding but I felt so glad and honoured to be involved in one of the most memorable occasion of her life. It’s a great stress reliever! When I used to travel a lot for work, I would always bring some stamps and craft supplies with me. After work, I’d do some stamping and it helps me to put aside work concerns and just enjoy myself. I love the look of appreciation & delight on my friends & family’s faces when they receive a card or project from me. It gives me so much joy to bless others through my passion for crafting. I love new ideas and new techniques and I love playing with all sorts of tools. Someday I hope to be able to teach others what I’ve learnt along the way and to inspire them. Don’t be afraid to try. Read craft books and magazines for ideas & tutorials and don’t forget to watch the videos on StampTV as visual aid is usually the fastest & easiest way to learn. I love to make mini albums – they are great gifts for birthdays. Being a guest designer for Melanie and being involved in a local fund raising event selling my cards. Otherwise, I can’t think of any - I love participating in challenges mainly for fun, but I’m too lazy to submit my work for publication. I think I like sketch challenges most of all or inspirational challenges. Colour challenges are usually difficult for me, because I only buy supplies in the colours I like. I speak 3 languages – English, Malay and Chinese but I can’t read nor write Chinese. Of all the languages I speak, I guess I am most fluent in English. I once applied to do an English course (teaching English as a second language) and at the interview, the interviewer (a Brit) said although he could not find anything wrong with my English technically, he said I had an “odd” way of using the language. I passed the interview but I decided not to do the course! LOL! I did Accounting at University mainly because I felt it was a course my parents would approve. It was very expensive for them to send me to study in Australia. If I had freedom of choice I would have done Psychology. When I was young, I wanted to be a Singer in a rock band! I swim quite well, but I’m afraid of swimming in the sea because of the movie "Jaws"! I love cartoons – my current favourite is Ben 10! I love to read and I can read more than 10 books in a week if I do not stamp, LOL! Now let's go get more "A Year of Borders" inspiration on Kary's blog! be sure to leave her some love!! Tuesday I got to do something a bit out of my routine: meet up with some fantastic StampTV members and friends! 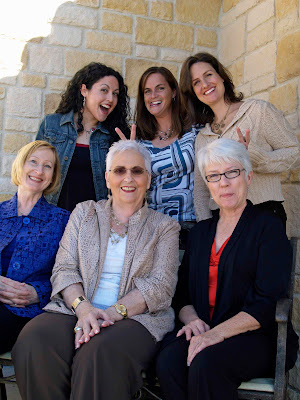 :) We had a delicious lunch at Mimi's north of Austin (Round Rock) and chatted about all things stamping (most questions for us on the GKD team were bout Gina, no surprise there!) , sounds like a little bit of heaven, doesn't it? You may have already seen the above photo on Facebook already, but you may NOT have seen this one! This was on the photographer's orders to "Now be silly!" Ah, the poor front row has a slight disadvantage to the back row! And I have to point out Carolyn, takes silly to next level with her tongue out, she is SO good at following directions! I will always remember this get together, thanks to Lagene for organizing, she was visiting Texas this week! meeting up with other stampers and finally coming face to face with relationships I've been cultivating online over the years is something I hope to do more often. 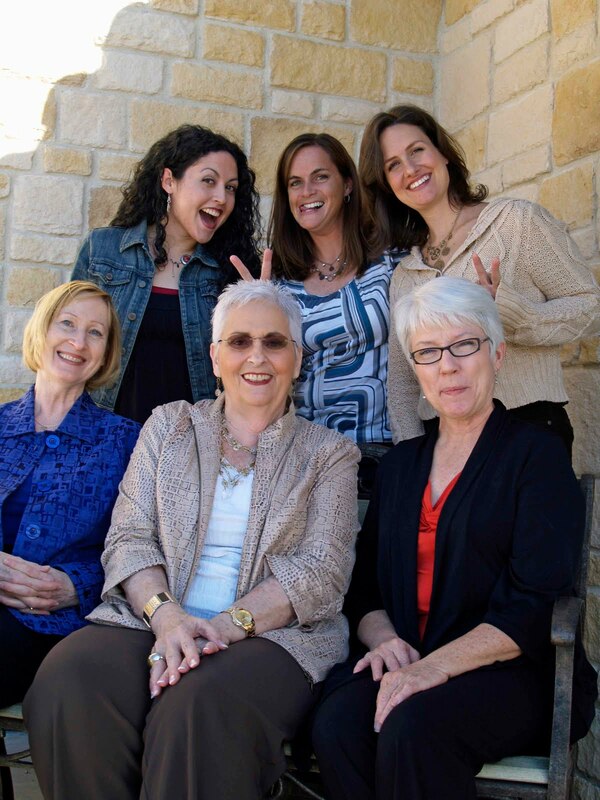 If you live in or anywhere near the Austin area (Janice drove in from WACO! (100 miles north! ), I would love to try to meet up, so let me know! I have also wanted to to try to do some stamping workshops or shoebox swaps if i can just get myself together to plan it! Would love to have you join in! BTW, what an unexpected surprise to meet Janice, I didn't know she was going to be there until i walked in the restaurant, hee hee! She was my guest designer a few months back! Hello! Are you as excited about the new episodes Gina will be adding to StampTV each week as I am? 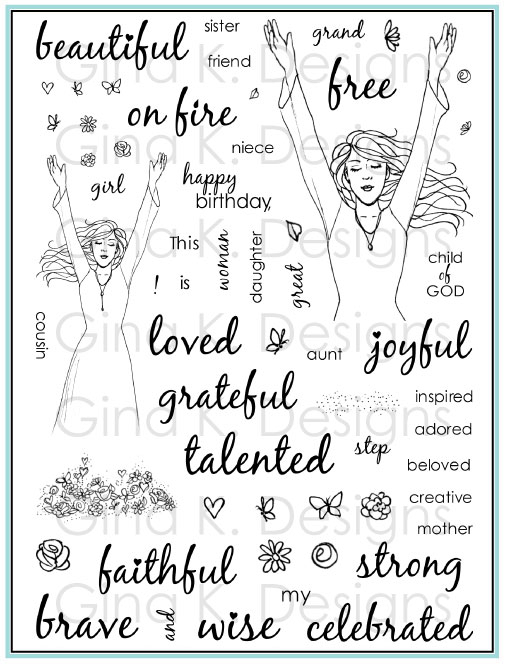 In each episode, you will see her creating a card from start to finish with each of our new release sets during the month, we are just thrilled to share more ways to use all our new stamps so they become new favorites in your collection! Mondays are devoted to a sketch she'll create, here is the first sketch below! I used my "A Year of Borders" set to make a card with this sketch. I took a small liberty on using the whole border as a rectangle instead of an oval, but if you look closely, there is a round design embossed (Sizzix folder) into the Fresh Asparagus mat that frames the image imilar to the sketch. ("Festive Frame" would have been perfect with this sketch to use with the border going across, (I just might have to make another entry doing so!) but today I really wanted to use just the borders set.) I sponged the edges with some olive ink to make the pattern pop out more. Border is embossed in gold, colored with Copics (E13 and E57 for pinecones, R37 and R59 for flowers, YG23 and G99 for needles), and matted onto Good as Gold CS. Tip: Make the greenery as full as you desire by making quick swipes with your marker starting at the base of the needles and working outward, don't worry abut tracing the image exactly! I like to use two greens to give the needles more depth. The little greeting from the STV kit "Winter Wonderland"(isn't that font lovely with this image?) is embossed Innocent Pink, which I die cut with a Petite Oval and sponged with Vivid Brick, I love how that brings out the dark and lighter areas of the poinsettias. 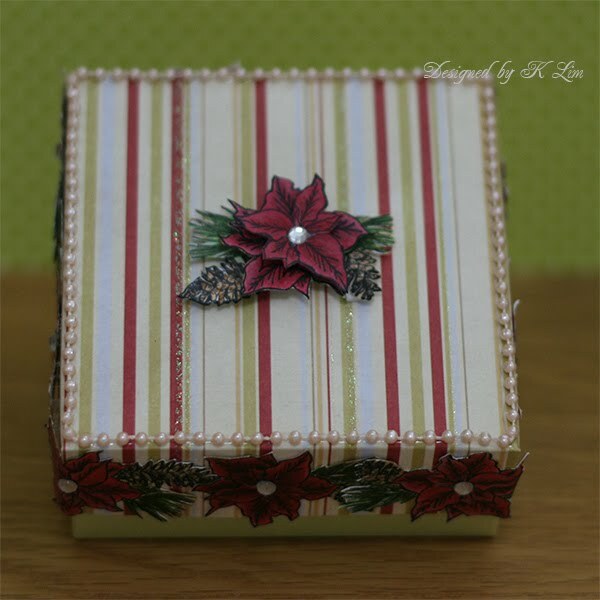 I added some punched Fancy Corners, gold adhesive nail heads and stitched red ribbon to complete the sketch. As you can see the embossed border panel slides out, it can now be used as a bookmark! Card and gift, all in one, I love it! Check out Gina's video now on StampTV. I don't know what set she's using today, but it's sure to be a good one! You'll see this sample of mine PLUS our other design team members and illustrators interpretations of the sketch there as well. A Year of Borders Now Available!